Prior to the revolution, twelve Liturgies were performed in the Lavra daily, and there were over three thousand of inhabitants. Chanting was one of the primary occupations. Lavra chanting was determined to consolidate not only the brethren, but also all the pilgrims who came to the monastery and sought for the sense of peace here. 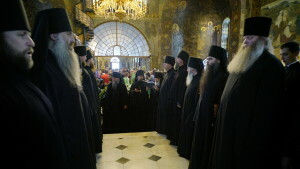 Lavra chanting was the way for people to reach the peace of spirit, which all the Orthodox Christians are appealed for. All the canons and the Statute of the Orthodox Church are also adhered to in the Lavra, but the peculiarities are the case only in the Kiev-Caves monastery. For instance, the Great Penitential Canon of St. Andrew of Crete and life of Mary the Egyptian are chanted in a singing voice with a canonarch, the Acathistus devoted to the Dormition of the Most Holy Theotokos performed in a composite way each Wednesday is also chanted in a singing voice. During the Great Fast before the revolution, the Liturgy of the Presanctified Gifts was performed five times a week. This was related to the tradition of the Studite statute as well as to the fact that lots of pilgrims arrived to the Lavra being the second Jerusalem, and every day they had a possibility to take communion. Rebirth of the Lavra chanting is tied with the names of those who sang in the choir stall back before the time of the Lavra dismissal: schemahegumen Agapitus, hegumen Paphnutius (Theophilus in the schema). At that, the most significant contribution was made by schemaarchimandrite Dionysius, mostly known as father Spyridon. Father knew the festal as well as everyday divine services’ chantings, and these chantings have been restored through him. Father Spyridon advised that there were always two choir stall singing for not merely festal, but also everyday services as well as Liturgies in the Lavra before, always performed with a canonarch. There even was a regular school in the Lavra before the revolution, where chanting along with general subjects was studied. The pupils of this school were canonarchs for the choir stalls. Now the tradition of performing the divine service with a canonarch is also restored. Each choir stall has its canonarch. During the most important moments of the divine service, the two choir stalls make the so called “convergence”, for example, during the “little entrance” (within the vespers), great doxology, “A mercy of peace» (within the Liturgy). At these moments, the two choirs gather in the middle of the church and sing jointly. Then they form a semicircle turned to the center of this semicircle. The regent (choirmaster) rules the choir and the canonarch stands near him. Father Spyridon also knew the technical peculiarities of where the choirmaster stood, how the voices were to be placed in the choir stall and the moments the voices were to be moved during the divine service. The Lavra continues its rebirth. It was not long since its reopening and monastic life revival. Much has to be arranged and the forgotten to be turned back. However, it is believed that with the prayers of the Caves’ saints and due to the protection of the Most Holy Theotokos, one of the prokeimena called “Sing praises to God, sing praises: sing praises unto our King, sing praises” shall awaken hearts of the faithful who find confidence in God. Activities involving children are the evidence of the particular protection of the Most Holy Mother of God in the monastery life of the Kiev-Caves Lavra. This is the way God calls not only adults through becoming monks but also the purest and most generous souls to serve Him. In January, 2009, with the blessing of the Vicegerent of the Kiev-Caves Lavra, metropolitan Pavel, and under the charge of the church statute observer and the regent of the left choir stall of the brethren choir, archimandrite Polycarp, children’s choir was formed at the Lavra. Cantatory team followed the long term perspective that the children would sing at divine services in the Church in honor of the Joy of all Sorrows Mother of God Icon in the future, where restoration work had been completed by then. Presently, the children’s choir sings at the late Sunday Liturgy in the Church of the Conception of St. Anna in the Lavra. At present, the choir consists of fifty children of different age. 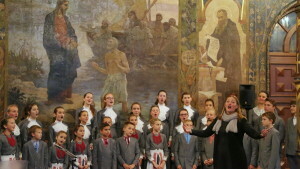 In should be noted that the children’s choir of the Kiev-Caves Lavra is not bounded in its activity merely by performing vocal parts and singing at the choir stall, but all the participants of the vocal team and their parents form a large friendly family, united by the faith in God erasing age boundaries and civil social conditionalities. Children come to the Lavra for rehearsals, enrich the divine services by their chanting at the choir stall, and this unites them. By absorbing the favorable atmosphere of the Kiev-Caves Lavra, children partake of the Orthodox traditions and spiritual values, which they later carry lifelong.